Now it is easy to read that and fall into the materialistic trap of thinking it's all about things, but that is not what it says to me. It says to take things to the next level. Realize that I have been in the same place in my life for almost 5 years now. Teaching. Working on a Ph.D. Paying bills. Living basically paycheck to paycheck. I want to not do that anymore. I know in large part it is due to my mindset. I have a mindset from years of struggling with money. We don't struggle anymore and yet still live like we do. Which in turn causes us to sometimes struggle with money. I don't even know if that makes sense but it does to me. 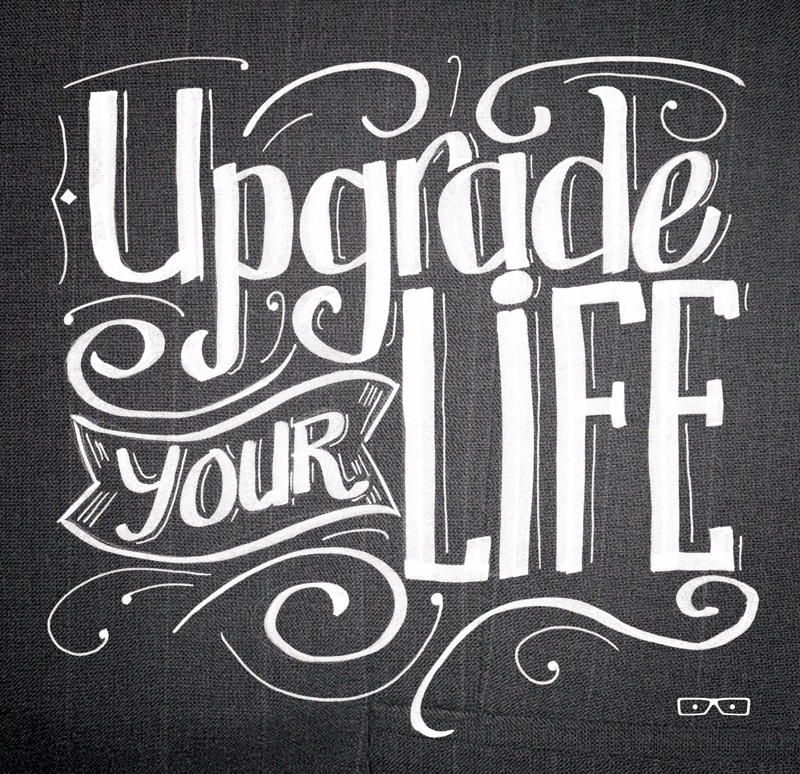 So what this upgrade is about, to me, is changing my mindset and living a life of ease and comfort - at least as far as money is concerned. So how do I do that? It's actually kind of easy, stop spending. We went out and spent almost $200 for a party we are having today. Yes, I realize that we are having a party and so spending some money is not out of the question, but $200??? Couldn't we have gone with something simpler? And it's not even the fact that we spent $200, it's the fact that we just did it. No planning, no saving, no nothing, just went out and spent the money. That is where our downfall is. We want something, we buy it. I'm the worst, I will not lie. I literally get ideas in my head and boom go on Amazon and buy it. So I freely admit, the vast majority of this is my fault. But in a way that's good. If I'm the problem, I can fix it. So I need to put a moratorium on spending. Starting today. I want $5,000 in the savings and the credit cards paid off. Once we hit those numbers, I will set a saving goal each month. Easy peasy. But this applies to other areas of my life too. It's funny how he specifically mentions a Ph.D. because I am tired of being a candidate and I feel it's more than time to upgrade that to complete. Funny that that was on my roadmap yesterday and then this popped up last night. Huh..... Anyway, this is relatively easy. I need to get the refi so I can pay Walden. Sign up for the new quarter in August and just get it done. I will need to devote lots and lots of time to it, but it can be done and I can do it. Next is school. I've been teaching by the seat of my pants for 8 years. It's time to upgrade my teaching and that's kind of what I've been working on all summer. I want lesson plans written out and ready to go. I want engaging activities that help the students learn. That requires planning on my part. I will need to plan ahead and have things ready for classes beforehand and not at the last minute. I have curriculum maps for all my classes, I just need to fill in some details for some of them. For chemistry, I've got the first unit done. AP biology is almost done. I just need to work on AP Chem and Conceptual science. I also need to have a teaching plan and stick to it. I bounce around too much, kind of like a dog.......oh squirrel... So I need to just get things laid out. Then maybe once a month I will devote a Friday to prep for the next unit. So, what is the common thread through all of these topics??? Focus. I need to be focused and present in my life. I need to keep on top of all aspects of it. I know what that means for me, making forward progress every single day. For the money, I need to keep on top of the bank account and the spending. For the Ph.D. I need to work on it every single day and set goals and stick to them. For school, be highly organized and don't let things slide. Stay on top of them. If I develop a roadmap and really, truly stick to it, I will actually have more free time. I won't have time wasted bemoaning the things I don't want to do or avoiding the things I know I should be doing. Having time set aside for doing all the things I need to do will actually give me more free time in the end. This month I'm going to focus on school and money. School because I need to get my first unit lessons in order before school starts so I'm ready to tackle the first unit. Money because I just need to start that here and now. That is actually one of the easiest to get under control, so no time like the present. I almost forgot one of the most important categories - my health. I am 266# and 50% body fat. Nice. I have managed to work myself into the heaviest weight I've ever been. Time to put the brakes on the upward climb and reverse the trend. That is just a matter of watching what I eat and working out daily. It's that simple and it's that hard. I will need to develop a little better plan for that. Not really, I just need to do it. So starting tomorrow, I focus on money, school, and health. I need to make working out and eating right, not an option. Kind of like brushing my teeth. It needs to be a non-negotiable item in my daily life. Okay, the word of the rest of the year upgrades. 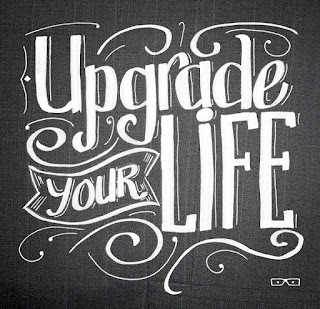 I'm working on the upgrade in my life.